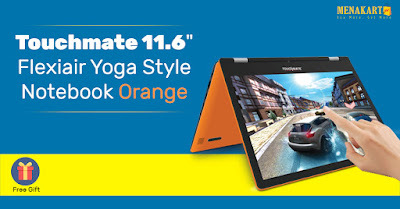 TOUCHMATE 11.6" Windows Yoga Style Notebook. Runs on Windows®10 , Intel® 1.8 Ghz Atom Quad Core Processors, 2 GB RAM, 32 GB Memory, Expandable By Micro SD up to 64GB, 5Mp Camera, Bluetooth 4.0, Touchscreen HD Panel 1366 x 768 Resolution, Direct USB Slot To Use Pendrive & External Hard disk, Direct HDMI Port To Connect TV & Projector. Style, Performance, Portability, Wireless Printing & Bugs Free Technology.